Ok a double whammy today. Two birds with one stone. 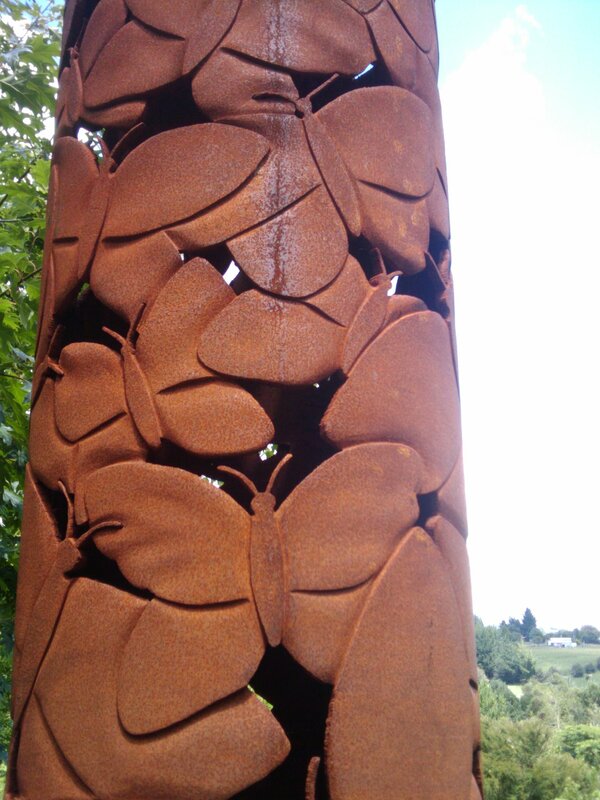 Occasionally I have a go at the WordPress Postaday photo challenge and this week’s subject matter of “Scale” appealed to me so I thought I would have a go. We were all doing our own thing today as regards training so I, given that I didn’t have to keep up with anyone, I set off with the theme of scale in mind and kept my eye out for appropriate subject matter. I walk along the mighty river Waikato. The longest river in New Zealand that flows through Hamilton, affectionately known as “The Tron”. (but nobody seems to know why and a Google search reveals some strange responses, this one from the “uncyclopaedia” being the most bizarre but also most amusing). The well-used path follows the river sometimes on boardwalks and sometimes on concrete paths. It takes you through the heart of the city, through the bush in the outskirts where there are natural reserves and through Hamilton’s world famous gardens which are beautiful and full of families picnicking, enjoying the flowers, playing games and enjoying the many festivals especially on Sundays holiday weekends like this one. My walk takes me across two of the bridges, and as I looked down the river I saw a small rowing boat pulled up on the banks in front of the Rowing Club. 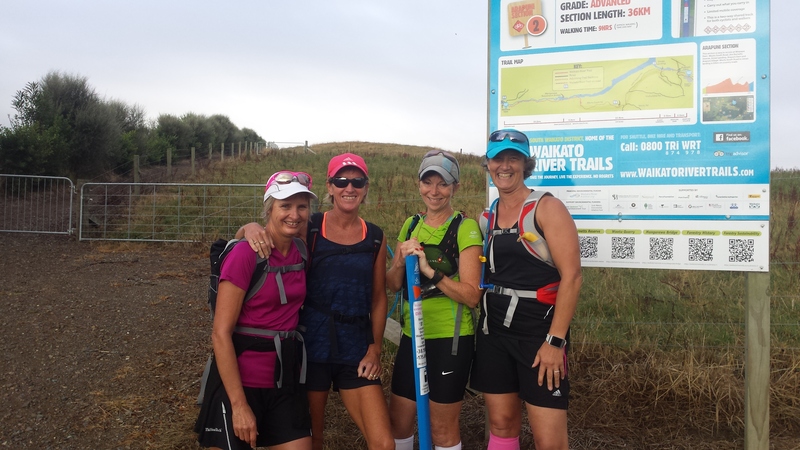 The Waikato is a river used by rowers. Every morning and evening in the summer you can hear the calls of the support boats as the crews train. Eights, Fours and Pairs from all the local secondary schools, doing the hard yards, oars in and oars out in unison, bodies moving as one as they power down the river. The Mighty Waikato and a tiny row boat. Onwards I walked. 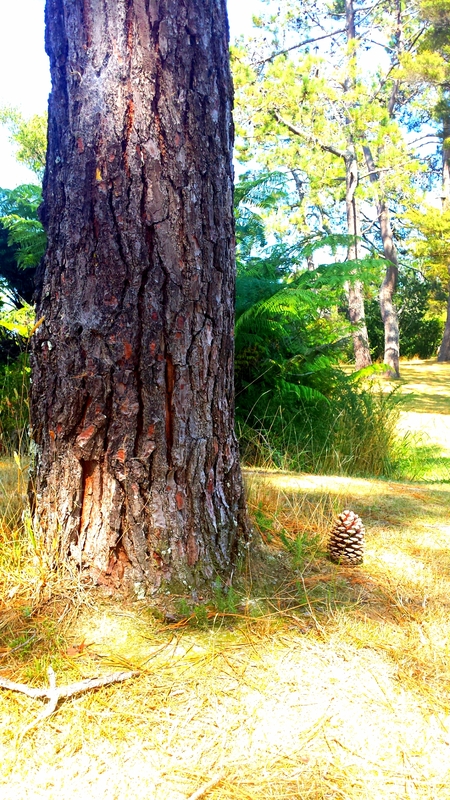 As I climbed the hill out of the gardens and past the cemetery to the trig point, I spotted a pine cone lying on the ground next to the tree from which it had fallen. That too looked like a possibility. The seed, the future tree next to its parent, the majestic pine tree. I picked the cone up thinking I might find another place for it although I rather like the photo of it next to its parent tree. A few yards further on there is a view point across the river and out to the Waikato. 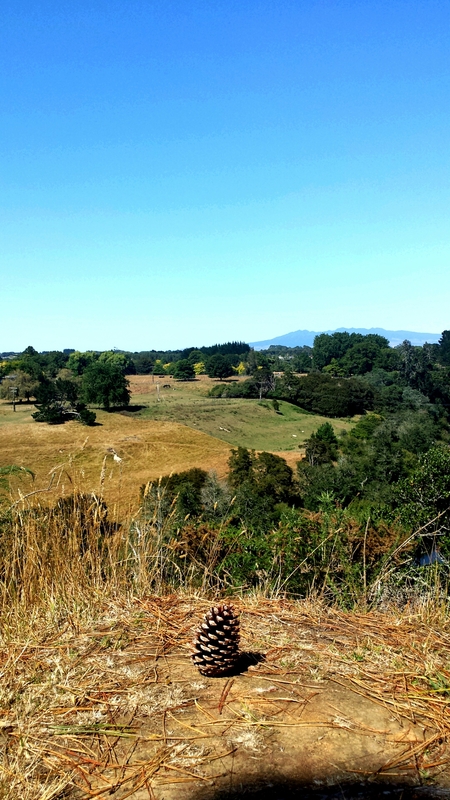 The juxtaposition of the small pine cone against the backdrop of the river, the Waikato scenery and Pirongia in the distance was appealing. I am still unsure which of these photos I prefer. Maybe I’ll let you decide. Make a comment and let me know. 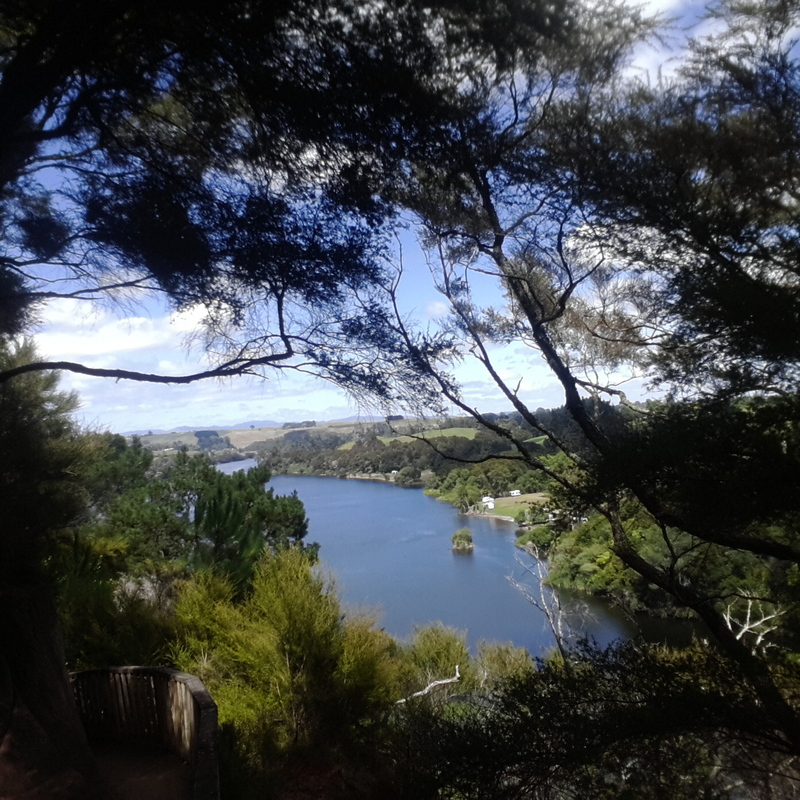 Earlier this year I had the opportunity to attend the Learning@schools conference in Rotorua where I listened to some inspiring speakers and shared teaching experiences and ideas with colleagues from all over the country. I should give some background as to how I got to be there. My background is in Language teaching – I am a pretty good French speaker, and would possibly once have claimed to be a fluent French speaker, but although I can usually communicate what I want to say and can understand most of what others say to me, I am constantly learning new words and expressions so I’m not sure that fluent is the correct description. Then again I am always learning new English words and expressions too, I can’t always make myself understood and I don’t always understand what other say to me, so maybe I am not a fluent English speaker either!? Anyway, I am rambling so will get back to the point. I have also taught Physical Education over the years too; I have no formal qualifications in Phys Ed having done my Post Graduate Certificate of Education at Leeds University in French, German and Outdoor Education, but was a qualified gymnastics coach and have always been involved in sports. There is always a shortage of Phys Ed teachers, especially ones that can fill in the odd lesson here and there, and I pride myself on being flexible (both physically and metaphorically) so am happy to fill the gap when necessary. Having extra strings to my bow also gives me the opportunity to get out of the classroom sometimes, see students from a different perspective and keep me on my toes. Variety is the spice of life! I had thought that after seventeen years at a great school in the north of England and after travelling across the world to NZ, I would have a break from teaching, but once a teacher always a teacher, I suppose. Here I am working in another great school in the Waikato and my ability to be flexible has stood me in good stead. That, and my inability to say “no”, despite promising a former colleague that I would learn, has landed me with an interesting mixture of roles. I am still teaching French part time, I am also Outdoor Education Co-ordinator in charge of organising all the school camps, and I am the Teacher IT Coach. What sort of job is that, you ask? Well, at some point during my time in the great school in the North of England, I was having one of those natural slumps and a crisis of confidence in my abilities to be an effective teacher. I was getting rather bored with the daily grind of teaching the same old thing day after day, and I had had two or three years of always getting the lower ability French classes in Year 9 that were mainly populated with disaffected boys. Great kids on the whole but they just didn’t want to learn French! Fortunately for me, computers hit the scene and I thought that maybe this was the way forward to motivate these disaffected boys, after all they loved computer games! Our school was also blessed with a couple of inspirational and forward thinking ICT teachers who supported me and gave me lots of ideas. Fast forward a few years and despite not really understanding any of the tecchie stuff to do with computers, I love the opportunities that technology offers to us as teachers in our classrooms, and have developed some skills that I am in a position to pass on to others. I am often only one step ahead, and definitely several steps behind some of my colleagues but love being able to help and support those who need it and want it. Anyway, back to the Learning@schools conference – it was a great opportunity to find out what was going on in other schools around the country, network a bit and also share some of my ideas, so there I was. Rather than ramble on at length here are some links to the notes I made about some of the Keynote speakers and Break out sessions I attended.